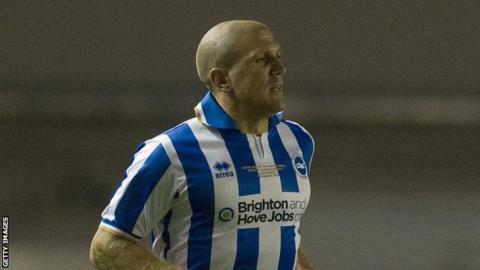 Brighton and Hove Albion defender Adam El-Abd believes the side will return stronger after the international break. The Seagulls have gone three games without a win but remain in the Championship play-off places. He told BBC Sussex: "Throughout the season you are going to have peaks and troughs. It's not always plain sailing. "It's about us as a group and how we aim to get better. There are things with the fluency of our passing game which we can improve on." The 28-year-old added: "It's been a good start. "From the first ten games it's very positive. We're sitting fifth and could have had a few more points had our luck been better. "We've got the international break to improve. "It's come at a good time as we've got a few injuries and little niggles throughout the squad. "It'll give everybody time to get those patched up, healed and ready to go again." El-Abd will now join up with the Egypt squad ahead of friendlies against Congo and Tunisia in Dubai. "I hope to get some game time and be part of the team," he said. "It's a different challenge and a new experience again. You're always learning."